Do we have to work in our groups? 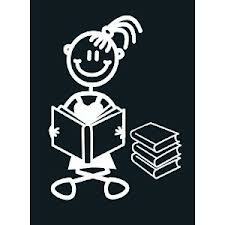 Use the book that your group has been given and use the internet if you want. Yes you have to work in groups because we are learning to help each other succeed. Further down this page are some activities and links to help you learn how to write an interesting piece. You are aiming for about half a page of writing with a picture so it looks good in your portfolio. Which of these pieces of writing is the most 'interesting'? and why? 2) Write a few sentences for your teacher explaining which piece you chose. Don't forget to include your reasons why you think it was more interesting and how the writer made it more interesting. Success Criteria 2: Give your teacher your answers to this question. What is a definition of 'interesting writing'? How do I make my writing more interesting? 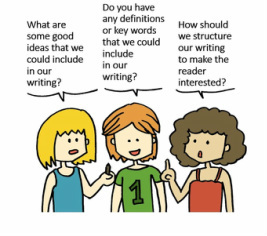 USE LOTS OF FACTS, IDEAS, DEFINITIONS AND INTERESTING WORDS! People like to read about things that are interesting to them. If it interests you, then it probably interests your reader. "She is gone and now, I am alone." This makes your reader want to find out what is going on; who is gone, why is she gone, what the heck is going on?! It could be a shocking fact or something that will be relevant to your reader. You could try something funny or odd that will make people curious. How can I extend my vocabulary about villains? Can I see an example of what you want us to write? 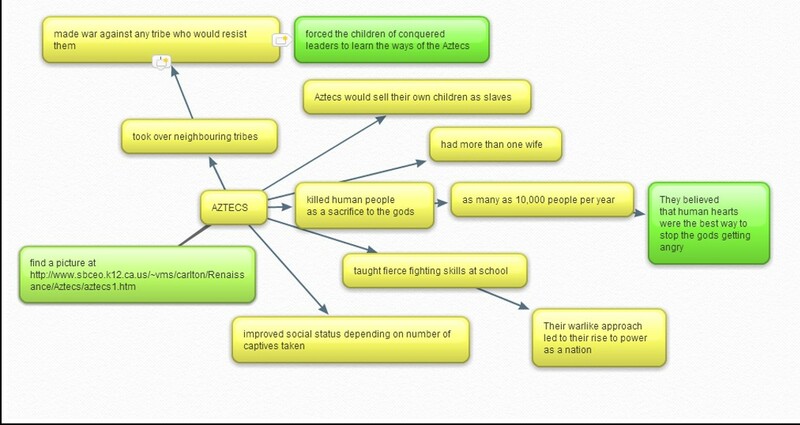 C. Conclusion = The Aztecs were a vicious killing nation. 1) It is wrong to kill other people, especially people from your own country. 3) It is a bad thing that they taught fighting skills because they encouraged the younger people to continue being violent. The Aztecs were a villainous culture because they sacrificed their own people, attacked other tribes and taught their children fighting skills at school. They were a violent race who also promoted violence to children. They lived in the area which is now known as Mexico. The Aztecs killed their own people in big ceremonies where they would use a knife to kill someone so that their blood would run down the steps for everyone to see. This shows that not only did they kill people but they also liked to make a very public show of the killing and wanted many people to see the blood. Bloodthirsty cultures enjoy watching death and killing because becomes addictive and it leads to a desire for more. A violent and power-hungry nation, the Aztecs attacked nearby tribes so that they could steal their lands and make the people become their slaves or sacrifice them. They were violent because they used poisonous arrows. slings, blowguns and spears to kill others. Only successful warriors were promoted in society. Historically, cultures that reward violence have run massive empires such as; the Greeks and the Romans. All the male children in Aztec society had to go to school and learn skills so that they could fight for their country. This shows that they valued the quality of aggressiveness and military skills. Many countries in the world today, still encourage their young people to learn military skills, including modern Mexico. All eighteen year old males must register for military service and some work in the army for a whole year. This is called conscription. So, the Aztecs were violent, bloodthirsty and they promoted violence to their young people. Violence was an integral part of their culture and this shows us that they were similar to modern day villains who display these qualities. In modern times, villainous cultures are less obvious as they show their villainy through devious and less obvious means. However, some cultures show their aggressive values through the requirement for young people to learn military skills. What websites can help us?